Makishi dancers have intrigued and intimidated audiences for centuries. The makishi are shrouded in secrecy and it is taboo to ask who hides behind the mask. The makishi are spirits that represent the ancestors and they command the utmost respect. 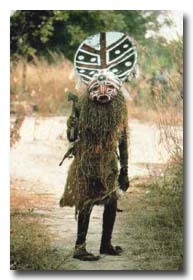 The makishi normally appear during the mukanda (circumcision ceremony), then return to their graves immediately afterwards. Their appearance creates an eerie but fascinating atmosphere. The mukanda takes place during the dry season from May to October and lasts between three to five months. The mukanda is a rite of passage for boys entering manhood. The makishi return to the land of the living to guide and protect the boys and their village during this period of transition. With a tense yet festive air, the makishi travel from village to village to announce that the mukanda is near. Several makishi remain in the village to keep the mothers at bay while the African drums beat loudly to drown out the screams of the boys as the chikenzi performs the circumcision. The boys are then taken to an area not far from the village where they will remain for several months. The boys in the mukanda encampment communicate with the village by song. Elder village guardians tend to the initiates while their wounds heal. There are magical carved pegs surrounding the camp to push back evil spirits. The encampment is also surrounded by lusumba, sticks covered with animal blood to warn women and the uncircumcised that they are not permitted in the area. The boys follow very strict rules of obedience and discipline as they learn about adult life. They are taught woodcarving, mask making, weaving and basketry. They also learn tusoma, an iconographic writing that expresses abstract ideas, theologies, spirituality and other philosophies. 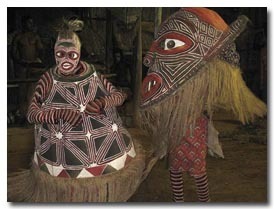 As with most African Customs, song and dance is crucial to their ceremonies. During the mukanda period call and response singing takes place between the mukanda camp and the village. The dancing involves twisting of the legs and waist for days on end. It is taken very seriously and nothing short of excellence is acceptable. After the healing process, the boys are taken to the river for purification. The boys are seen by the whole village for the first time since their initiation and the makishi are present to celebrate the event and to prevent the mothers from coming near. The mukanda is more than circumcision and discipline; it is a religious affair. The boys are dead to their childhood and have entered the realm of adulthood and communion with their ancestors. The graduation phase of the mukanda takes place at the end of the dry season, from October to November. Prior to the purification of the boys, the makishi begin roaming the village, dancing and performing, adding tension and excitement leading up to the big day. Before returning to their village, the boys are dressed in grass kilt skirts and hats. Their bodies are adorned with geometric symbols and they are grouped with the elders and reminded of their solemn oath to not speak of the secrets of the mukanda. The boys are seated on special mats where they receive food and presents. The boys then perform for the village, proudly displaying the dance they learned during the mukanda and celebrations extend into the night. At dawn the mukanda encampment is set ablaze while attendants and elders dance and shout, celebrating the new life of the young men. African Customs are rarely practiced today. Click on the links below for detailed information on these topics relating specifically to Africa..